HOUSTON – AZA lawyer Cameron Byrd has been recognized with only five other law firm associates nationwide for providing superior service to clients in BTI Client Services All-Stars 2018. BTI Consulting Group interviewed more than 350 in-house counsel for feedback on attorneys who exhibited high-quality service through responsiveness and a heightened sense of their clients’ goals. Mr. Byrd is the only one among the six associates honored who is not at a multinational Big Law firm. BTI rated more than 300 lawyers overall for 2018. Mr. Byrd was nominated by general counsel of a global company and lauded for being “highly effective” in helping his clients succeed. His award was noted in an article by Law360 here (subscription required). 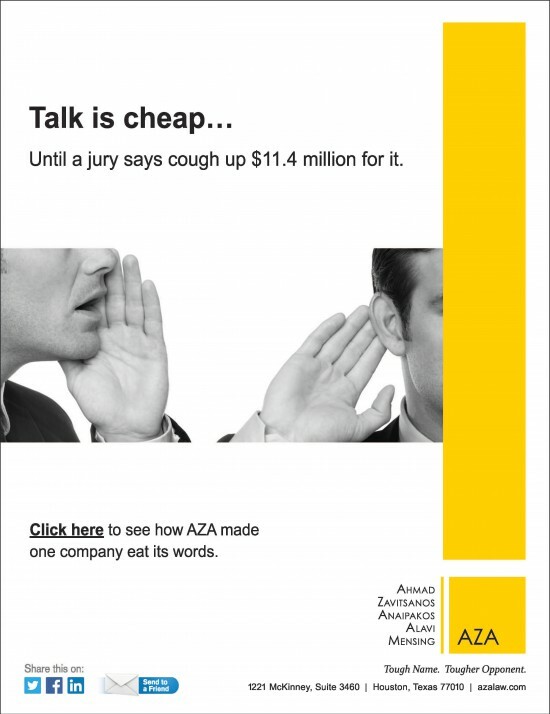 “Cameron has made a significant contribution from day one at AZA. He’s won a federal jury trial as first-chair and obviously impressed our clients for going above and beyond,” said John Zavitsanos, a founding partner in Ahmad, Zavitsanos, Anaipakos, Alavi & Mensing P.C., or AZA. Mr. Byrd is a trial lawyer who represents plaintiffs and defendants in cases involving financial services, breach of contract, covenants not to compete, employment claims, and intellectual property and trade secret disputes. His most recent trial resulted in a jury verdict that will mean recovery of more than $1 million for AZA’s insurance company clients. Mr. Byrd sat first chair, and, with fellow second-year lawyer Kelsi White, prevailed in a complex and relatively uncommon Uniform Commercial Code (UCC) secured-credit dispute involving insurance-company claims over structured-settlement payments, secured loans, securitized assets, and competing judgments. This trial win was rare both because it involved an uncommon section of the UCC and because it is very unusual for two second-year lawyers to manage and win a federal jury trial this complex. Mr. Byrd is a graduate of the University of Texas School of Law. During law school, Mr. Byrd interned with U.S. Magistrate Judge Jeffrey Manske of the Western District of Texas and served as teaching assistant for Professor Scott McCown’s Texas Civil Procedure course.